Netflix’s supernatural series Chilling Adventures of Sabrina is full of homages and Easter Eggs that touch on past horror films and television shows, witchcraft history, and ancient Roman and Greek mythology. In Part Two, Sabrina makes the decision to dedicate her studies exclusively to The Academy of Unseen Arts. Sabrina's boy and family drama, and her fight against the patriarchal structures of the witch and mortal worlds culminate in all hellfire breaking loose in the final episodes. The latter half of Part 2 also delves into a well-known ancient Greek myth, one that involves our heroine, Sabrina, and foreshadows the troubles to come. Having slain the angels/missionaries who were hellbent on converting – and killing – the witches and warlocks of the Church of Night, Sabrina is requested to provide an account of what happened to Father Blackwood and The Council. During the attack, Sabrina was impaled and killed by three arrows. Naturally, the Dark Lord had other plans for this particular witch. Sabrina miraculously rises from the dead, her eyes glazed over with milky white. After being resurrected, Sabrina manifests a new type of power, one capable of changing the weather and giving Rosalind's eyesight back. But during her confrontation with Father Blackwood, Sabrina remains stern and doesn't reveal her newfound abilities — or the details of her dark resurrection. Instead, Sabrina recounts the story of Pandora. According to Greek mythology, Pandora was created by the Gods as punishment meant to reveal the flaws and weaknesses of humanity. She was gifted a box by the Gods and warned never to open it as the box contained "special gifts." Pandora tried to tame her curiosity and avoid opening it, but eventually succumbed to her inquisitive nature. She opens the box and unleashes evil and illnesses upon the world. Terrified at what she had done, she closes the box, locking Hope inside. Sabrina recounts the tale of Pandora as a warning to Father Blackwood, who is eager to know where her new powers came from. He shouldn't open Pandora's box to try and understand Sabrina's full force and power. But the Greek myth foreshadows what comes later in the series. Sabrina, in this iteration, is the symbolic Pandora. She is given incredible gifts after her resurrection and uses those gifts to do what she believes are good deeds. 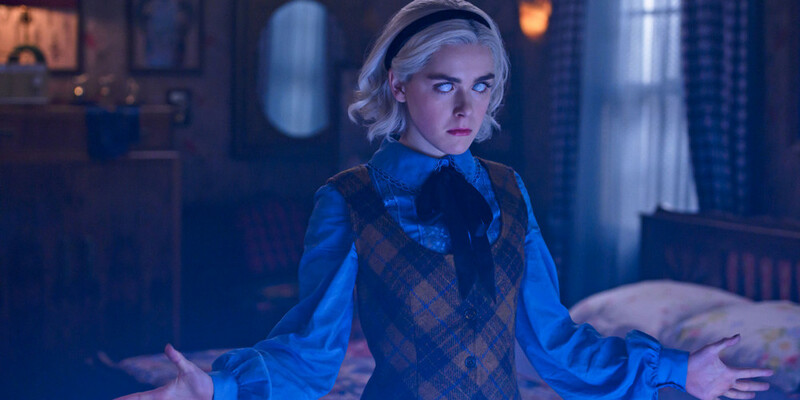 She also uses her abilities to dig deeper into Father Blackwood's plot to tarnish Sabrina's savior-like reputation and force The Council to order Ambrose to death for his alleged murder of the Anti-Pope. But as Part Two continues, it becomes clear Sabrina may in fact be the Pandora of Greendale. The teen witch discovers she is the Herald of Hell and the Dark Lord's greatest weapon. While Sabrina continues to unleash her gifts and use her curious mind to ward off the coming apocalypse detailed in the prophecy of the Herald, her actions quicken the arrival of it. The demons and vermin of Hell set to be unleashed are much like the evil spirits Pandora released. Curiosity and stubbornness are what connect Sabrina and Pandora and foreshadow Part 2's climax. Just like Pandora, Sabrina is given exceptional "gifts" by the Dark Lord. Her powers can heal those she loves and give her the opportunity to try and bring witches, warlocks, and mortals together. But as Sabrina continues to toy with her powers, testing her limits, she unwittingly falls in line with the prophecy and opens her own box of chaos. Unlike Pandora, Sabrina has the help of mortal and witch kind to send the Dark Lord back to the fiery pits of Hell. Her mortal friends, Harvey, Rosalind, and Theo, heroically shut the "box" by using ancient images to keep the gates of Hell closed for as long as possible. And when all hope seems lost — and the box that once held a demon in Part One cannot hold the Dark Lord — Nicholas Scratch offers his body as the vessel to hold Satan, enclosing the evil within him like a human box. Sabrina may not have known it, but her subtle allusion to Pandora's box foreshadowed what could become of the world. As Greendale's Pandora, Sabrina nearly unleashed the evils of Hell when her curiosity and stubbornness got the better of her. Abusing her powers, or gifts, Sabrina opened a Pandora's box that could have engulfed the world in hellfire. But thanks to the goodness of her friends and family, evil is defeated and the Dark Lord is sent back to Hell — at the price of losing Nicholas Scratch. Like Pandora, Sabrina closed the box, leaving Hope to live on into the next season. Part 2 of Chilling Adventures of Sabrina is available to stream now on Netflix.